Indian food is so delicious, but I'm usually too intimidated to make it at home. Too many spices and too much time required. 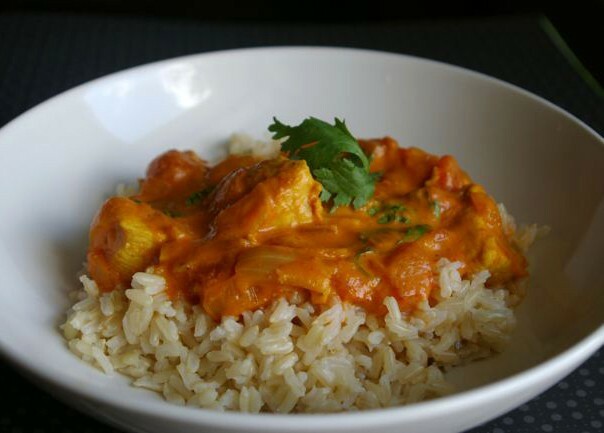 Well, here's an easy Indian recipe for butter chicken (aka. murgh makhani). The dish has chunks of marinated chicken cooked in a sauce of butter, tomato, cream, and lots of spices. The bright orange sauce is so rich and flavorful, I feel like I need to learn how to make naan to soak it all up with. Though super tasty, for juicier chicken, next time I think I might cook the chicken on the grill, kabob-style, and then toss it into the sauce. Saute the onion in the butter until soft. Add marinated chicken and cook about 10 minutes. Add the tomato sauce and diced tomatoes. Cook for 30 minutes over medium-low heat with the lid on. Add a few more dashes of curry, cayenne, and garam masala and season to taste. Add the whipping cream and cilantro just before serving over Basmati rice.